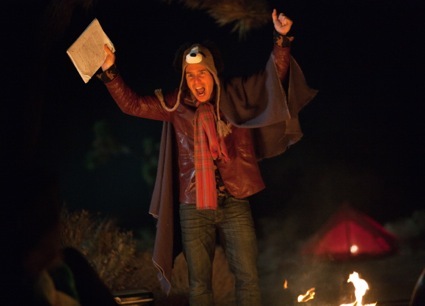 With a little over a week before Martin McDonagh's slam-bang Seven Psychopaths opens in theaters, the fun is just starting. I caught the film at the Toronto International Film Festival and it's as much fun as this Red Band behind-the-scenes trailer suggests. Check out the verbal hijinks between Sam Rockwell and Colin Farrell that concludes with the former telling the latter: "I want to jump inside your pants." Also, check out Movieline's gallery of exclusive shots of Rockwell from the movie. Trivia: McDonagh told me that Farrell found that wacky knit cap that Rockwell wears at a convenience store where he also picked up some chocolate milk and a bag of cheese puffs — all props that Rockwell uses for laughs in the film. Written and Directed by McDonagh, Seven Psychopaths is the story of a struggling and blocked screenwriter (Farrell) who unwittingly becomes entangled in the Los Angeles criminal underworld after his oddball friends, played by Walken and Rockwell, kidnap a gangster’s (Woody Harrelson) beloved Shih Tzu. Yep, it's all that and a truly memorable exploding head scene. Here's the clip.